This welcoming single level home features extensive upgrades including a new kitchen, bathrooms, windows, furnace & A/C, plantation shutters & plush neutral carpet. Oversized family room with wood beam ceiling. The kitchen features newer cabinets, granite counter tops, stainless steel appliances. Adjacent is the large, inviting dining room. Bright master bedroom with mountain views. The backyard features a sparkling pool, built-in BBQ. and mountain views. Leased solar. Award Winning Poway School District. This warm and welcoming single level home features extensive upgrades including a new kitchen, bathrooms, windows, furnace & A/C, plantation shutters and plush neutral carpet. You will enjoy the oversized family room with wood beam ceiling, built in bookcase, two ceiling fans, wood burning fireplace and direct access to the backyard. The kitchen features newer cabinets, granite counter tops, stainless steel appliances and space for a breakfast table. Adjacent is the large, inviting dining room with fireplace and nice view of the mountains. The master bedroom is bright and features mirrored wardrobes, sliding door leading to the backyard; showcasing the mountain views. The master bathroom offers a large shower with travertine tiles. The secondary bedrooms are bright, warm and inviting. The backyard features a sparkling pool, built in BBQ, and mountain views. 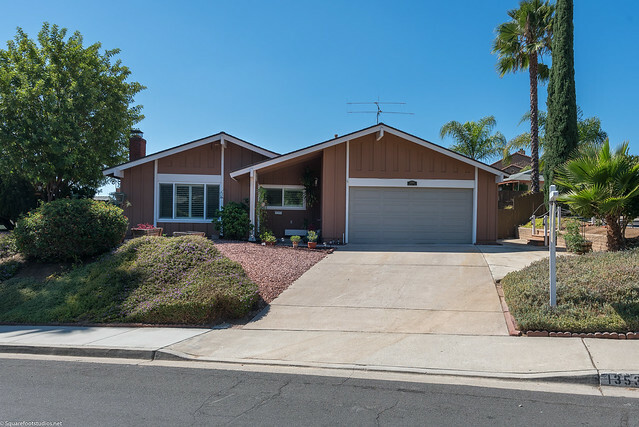 Other features of this home include leased solar system, private corner lot, and located in the Award Winning Poway School District. This home is truly move-in ready!